Congratulation for the beautiful software!! Is there a functional postprocessor for the latest Staublì controllers? The one in the software is not compiling in correct val3 .7 language. Is there a page for the license information? We have a draft regarding Staubli's VAL3 post processor (see file attached). 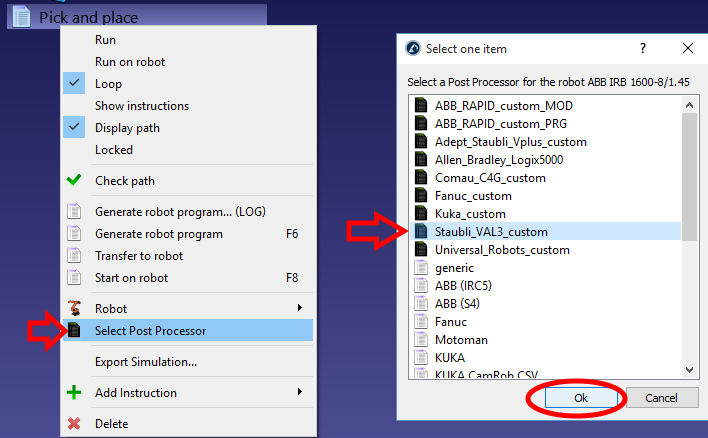 To try it, you must place this file in the folder "C:\RoboDK\Posts\", then, right click your program, then "Select Post Processor" and select VAL3's post. You can modify it manually or by selecting "Program->Add/Edit Post Processor"). This post is not provided with the default install as we have never tested it and probably needs some retouching. If you have a chance to try it and provide feedback we can improve VAL3's post. The trial version has some limitations after 60 days, such as saving your project. A commercial license is 2995$US and it includes one year support and updates. We are also providing free educational licenses.